Author Lynne Cherry’s career is as colorful as her many publications. As well as being the author and illustrator of over thirty award-winning books for children, she is a filmmaker, teacher, and environmental activist. Her best-selling books, The Great Kapok Tree and A River Ran are inspired by the natural world and encourage the same inspiration in children to make a difference. Cherry was selected for Publishers Weekly Green Books for Kids Award, as well as the National Best Books Award for Young Adult Education by USA Booknews, the School Library Journal‘s Best Books distinction in 2008, the National Parenting Publications Association Gold Award, and the honor of the Green Earth Book Award. 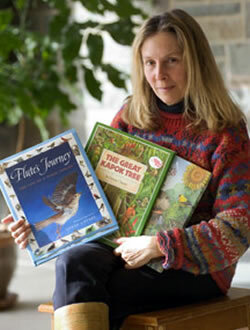 Three of Cherry’s books were chosen for the list of 40 Best Classic Nature Books of the Century by the American Horticulture Society. In 1993, Cherry was named the Environmental Educator of the Year by the North American Association of Environmental Educators. The Little Read book is The Great Kapok Tree. While reading to her children, Wiles fell in love with children’s books. She sold her first picture book, Freedom Summer (Simon & Schuster/Atheneum 2001), in 1998, followed that same year by her first novel, Love, Ruby Lavender (Harcourt 2001). Wiles’ work has received the Ezra Jack Keats New Writer Award, the PEN/Phyllis Reynolds Naylor Working Writer Fellowship, and a Golden Kite Honor from SCBWI. Her novel Each Little Bird That Sings was awarded the E.B. White Read Aloud Award and was a 2005 National Book Award finalist. Wiles lives in Atlanta, GA. In 2010, she will publish the first novel in a young-readers trilogy about the 1960s. The Little Read book is Love, Ruby Lavender. Julia Alvarez was born in the United States but spent the first 10 years of her life in the Dominican Republic. She had to adjust to a new language and culture after her family moved back to the United States. She is an author whose work bridges cultures and generations. She writes novels, essays, books for young readers and poetry. On April 4, the author visited Hickory to talk about his work and to hold a book signing event. Immediately after the event, 180 students from the three school districts were recognized for the poetry and artwork that they created after studying Lansky’s books. More than 2 million copies of Lansky’s books have been sold, including “Mary Had a Little Jam” and “If Kids Ruled the School.” He is the creator of the Web site www.gigglepoetry.com, which encourages children to read and write poetry. Children’s writer of “fractured fairy tales,” Jon Scieszka grew up in Flint, Michigan and attended Culver Military Academy. After graduating, Scieszka studied medicine at Albion College; however, he abruptly changed career paths when he left Albion and enrolled in classes at Columbia University where he pursued his M.F.A. Scieszka, following in the footsteps of his father, began teaching and has worked with children between first and eighth grades. He began writing children’s books, telling off-the-wall tales and adding twists to traditional stories, in 1994. His first book, The Stinky Cheese Man won the 1994 Rhode Island Children’s Book Award and Georgia’s Children’s Choice Award in 1997. The work of Scieszka and his illustrator Lane Smith is notable because it appeals to a broad audience of both adults and children. Scieszka currently lives in Brooklyn, New York with his wife and two children.